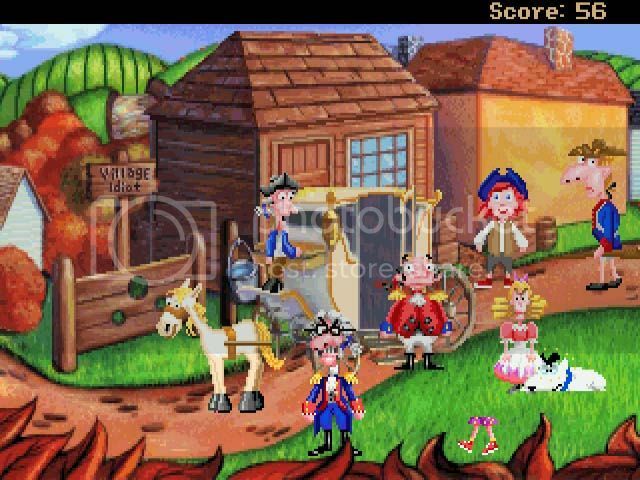 I played Pepper’s Adventure in Time many years ago, and I love it, and it taught me a respect and appreciation for American History albeit with humor and flair. This Adventure Game is a great one for new Adventure Game players as well as for new gamers to dive into Adventure Games because of it’s wonderful story, funny characters, good gameplay, and challenging puzzles. Veterans will find a lot to love about this delightful game. Even though this Adventure is more geared toward kids than adults. Adults will enjoy playing this game along with their child, and maybe even alone as it is that good. Pepper’s Adventure in Time stands the test in time, such as the terrible puns considering the going back in time narrative to fix what Pepper’s evil Uncle Fred turning poor Ben Franklin into a flower child, and because of the entertainment and education value of course with artistic license. Pepper’s Adventure in Time is more Artistic license than historical fact, but it is great fun to play this gem of an Adventure. A typical beautiful day, Pepper Pumpernickel is with her best friend, Lockjaw, a dog minding their own business in the front yard. She has to deal with her crazy next door neighbor who hates dogs especially Lockjaw, and evil Uncle Fred. Pepper’s evil Uncle is inventing a time machine to change history, he has something against Ben Franklin, typical in most cartoons, the evil characters are evil just because, and he is a really evil person to be oppose to Ben Franklin; one of the Founding Fathers of the U.S.A, the man on the $100 bill. He mixes the 1970’s with the late 1870’s, and this causes problems when Pepper’s dog Lockjaw bites Uncle Fred, and Lockjaw falls into the time vortex. Pepper is forced to go through time to rescue her dog. Unfortunately, more things go wrong, we get to meet the craziest villains ever in Adventure Game history, General Pugh Hugh, and his daughter Ima. Ima sees Lockjaw, and she wants him to be her pet. Poor Lockjaw, so through the rest of the game, Pepper’s sole goal is to set history right, and save Lockjaw. I miss the old Sierra Icon Interface from Adventures Games. 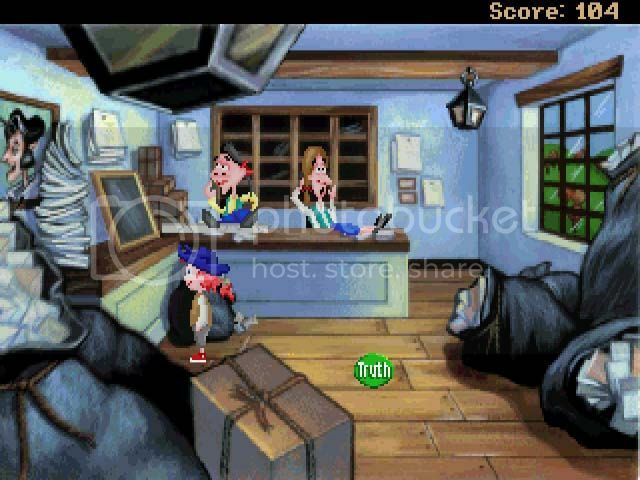 Pepper’s Adventure in Time has a typical Sierra Adventure game interface, if you played one Sierra game from the early 90’s then you know how to use the multi-icon interface going from Sierra game to Sierra game. This game has a good deal of freedom, but the cool thing about this game is that Pepper can fail, and the game lets the player restore to a previous saved game, or to go back and try again. In this department, this game was ahead of its time with the try again game function, so much less frustrating than the other Sierra games for big kids if you forgot to save the game and your character had died, you ended up having to replay huge portions of the game. My favorite icon is the Truth icon which is unique to this game, and is in no other Adventure game because I can use it within a scene in the game to gain some history. Ima has no style, but is the craziest villain ever. 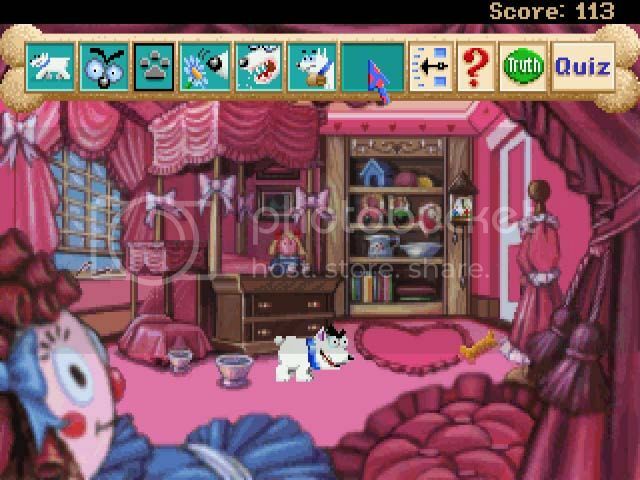 The game is unusual in the sense that the player can control Lockjaw, Pepper’s Dog. 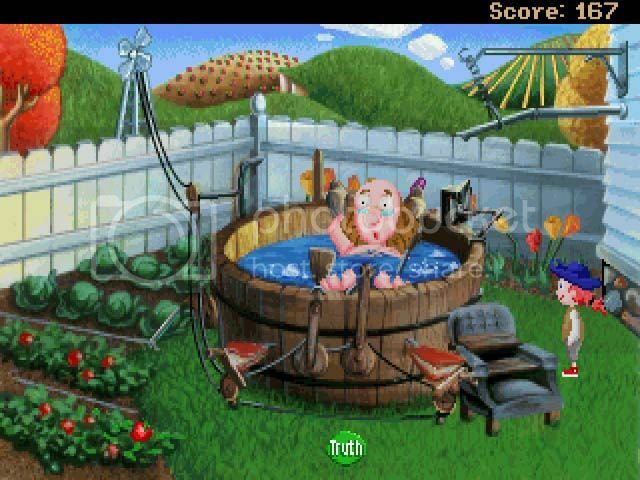 This is one of the few Adventure games that you can play a 4 legged character, almost all Adventure Games, it is usually always a two legged human or anthropomorphic animal character. It would be interesting to see more Adventure games where a player controlled a 4 legged creature or maybe even an octopus. The puzzles are typical inventory based ones where Pepper will pick up an object that isn’t nailed down. Sometimes items are combined in the inventory bag, then this combined item is used somewhere on a scene. 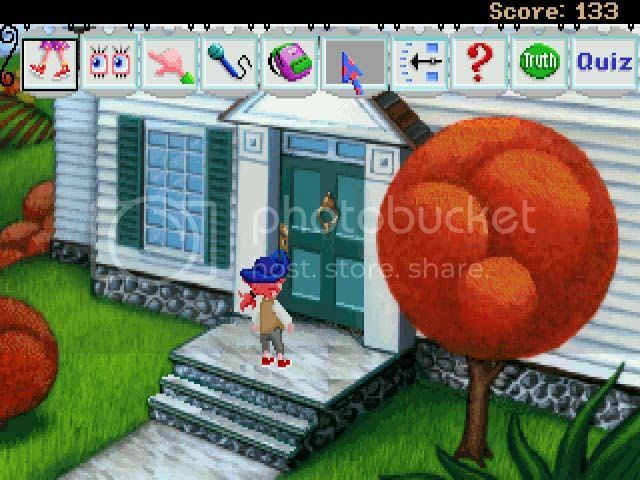 One thing that I dislike about this game, and it is perhaps the only thing is that it has a maze close toward near the end, and unfortunately it can’t be mapped on graph paper as it randomizes each time, also the orientation changes as well which makes it even more confusing, so as the player you have to randomly stumble upon Pepper rescuing her dog Lockjaw. 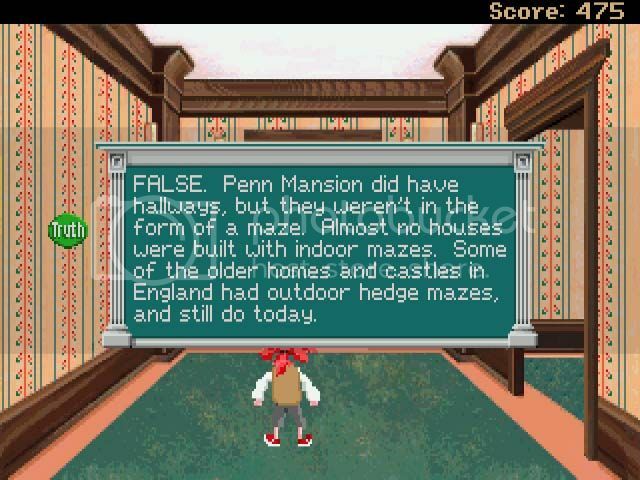 I hate mazes, then why did they put this maze in this game. This is the only negative about this game, and they put it so late into the game. 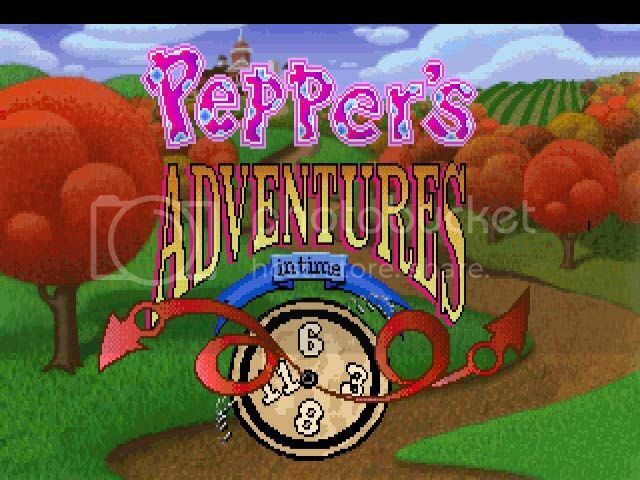 Pepper’s Adventure in Time is a great Adventure game because the imaginative time travel story, trying to set history right, with crazy characters, situations, and plus it is educational and entertaining as well. This game is a delight despite the maze in the above picture. When I played this game over 20 years ago as a child, I wanted to learn more about the life of Ben Franklin, and the founding of this country. Parents may think that games are a waste of time, but this one is certainly not, and is one of Sierra’s best Adventure games they ever made. Hard to find a reason why not to play this game. Too much boring dialogue in Act 2, when Pepper talks to the town’s inhabitants. It’s a pity that Sierra never made a CD-rom version of this game with voice actors talking. This would have improved and enhanced the game experience.